The laundry room is off of the kitchen. Beautiful Gulf front seven-bedroom, five-bath home with gourmet kitchen and sunken living room. The main level of this home offers a luxury kitchen, traditional dining area, wet bar area with additional dining, sunken living room, king bedroom with private bath and queen bedroom which shares a bath with the living area. The south side of the living area is all glass doors and windows offering wonderful Gulf views. The top floor of the home offers a king master suite with a luxury master bath and small private Gulf facing balcony. There are two additional queen bedrooms on this level which share a hall bath. The lower level of the home offers two bedrooms and one bath. One of these bedroom has four twin beds, the other has a queen bed plus two twins. There is a two-car garage available for guest use plus parking for about six additional cars in the driveway. This is a delightful home with room for the entire extended family. Deck & kitchen are fabulous! Minor problems that the Mgmt company resolved immediately. Not as clean as we thought it should be. Lower bedrooms smell quite musty/were cold. Congratulations on your wedding! We're so glad you made some beautiful memories at 1304 Ariola and we would love for you to return for your future anniversaries! We would be happy to put a reservation in for you for next year if you'd like. Just give us a call or you can email us with that request. We appreciate your review and we hope to see you next year and for years to come! Spectacular location directly on the Gulf with wooden walk-over to the beach was perfect for our big family who traveled in from all over the country. We cooked most of the time in the large, well stocked kitchen with plenty of seating both inside or out. The new grill, large capacity washer & dryer were much appreciated too. This property is not new, but offered a comfortable, beach lovers atmosphere for everyone. The downstairs bedrooms and bath were a bit crowded with 8 adults, but we didn't spend much time there so it worked OK. We were also happy to find a walkover sidewalk to the Sound, where we picked up and dropped off folks wanting to enjoy our local boats. Special thanks to Paradise for helping us bring our family together for an extended stay! What an amazing time we had on Pensacola Beach! Great location, incredible views, overall we would recommend this property. We had 20 people and the house was very comfortable. We would however recommend an overall interior, exterior refresh and a new BBQ Grill. College reunion, had 24 friends, had a great time, weather was perfect, house was great and the Paradise Crew took great care of us. Thanks we will be back. Thank you for your review. We are glad to hear you enjoyed your stay at Ariola 1304 and look forward to seeing you again on your next trip to Pensacola Beach! A great house for our family of 15. Plenty of bedrooms, large kitchen and love that porch! Management company was great, made sure the week went well. The house was perfect for our family and perfect for our daughter's wedding. It was very comfortable and we enjoyed our stay. We'll definitely go through Paradise again when heading that direction. Service was great also! Very helpful staff, got into house early in time for wedding rehersal. Loved sitting outside and watching Gulf. We enjoyed our overall stay...house had plenty of space/bedrooms for 10 adults and 7 kids (all under 6 yrs). Good location and we liked the direct beach access. Areas of improvement include replacing some of the worn out pots/pans, at least two of the mattresses are beyond their useful life and the wireless internet access needs to be updated as it was not useful most of the trip. House was very clean and well laid out. We'll consider this house again if we return to the area. We booked this beautiful home months ago because we knew we might have as many as 14 family join us. The home was perfect and very roomy. Everyone enjoyed the home, the deck, the private walk to the beach and the incredible view. We hope to return in a year or two for another family reunion. Great house, suited are needs perfectly, will book again. When we arrived we were stunned as well as other 15 people staying with us. The property is great and what a location. We were next to the lot where my son's wedding took place. Our out of town guest were amazed. Great location great people great beach. What a way to go.. Very nice hime, great location. Washer was broken our entire stay so we couldn't do laundry so that was a real bummer. Other than that it was awesome! Very nice memories for Parent's 62nd wedding anniversary/family reunion. The house and location was what we expected. No misrepresentation in any area. The only negative to the whole week was how poorly the property was cleaned prior to our arrival. This was pointed out to the management and we will see what happens in our future rentals. Other then that we had a blast. 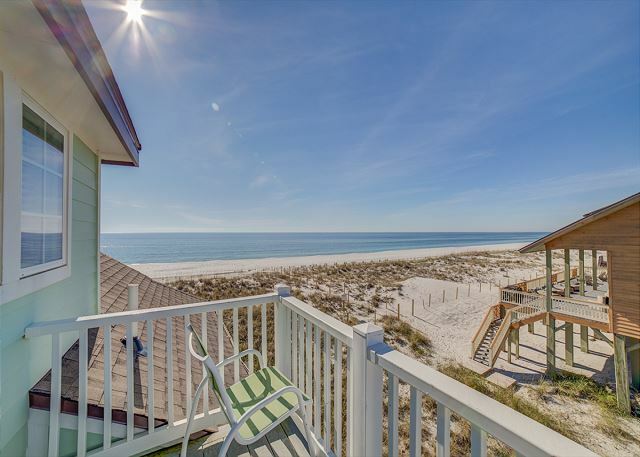 We love the back deck and boardwalk to beach. Very good. We enjoyed the new landscaping and the use of the garage. The owners are really doing a good job and we appreciate their efforts. Wonderful beach home for a family vacation! We had the best family vacation ever here! Such a nice home and plenty of room. The property management people were so nice & helpful too. Our stay was for work but our time there was made so much more pleasurable by the comfort and beauty of our location and home. The house and the accommodations were good and the staff was professional and courteous. The only exception inside of the house was a shower door that came loose from its hinges. Outside of the house, the rail on the beach access walkway was in need of repair in spots and one of the two wooden seats that was built in to the rail gave way under the weight of three people who sat on it at the same time. The seat was large enough to accommodate at least that many people so weight was not an issue. The bolts used to hold the seat up were sheered off and appeared rusted. No injuries occurred. Other than these two events all else was as advertised.